Ankar’s Hoagies, Chattanooga TN – Marie, Let's Eat! In his book Southern Belly, John T. Edge wrote about the Jacksonville-area “camel rider” pita sandwiches. This served as background for a longer 2012 story in The New York Times, in which he mentioned that the riders have been spotted in a few other cities around the southeast. Edge mentioned Birmingham and Columbus (where, our friend Matt pointed out, camel riders have been a staple at a restaurant called Speakeasy for decades), but it turns out that camel riders have also made it as far as Chattanooga. 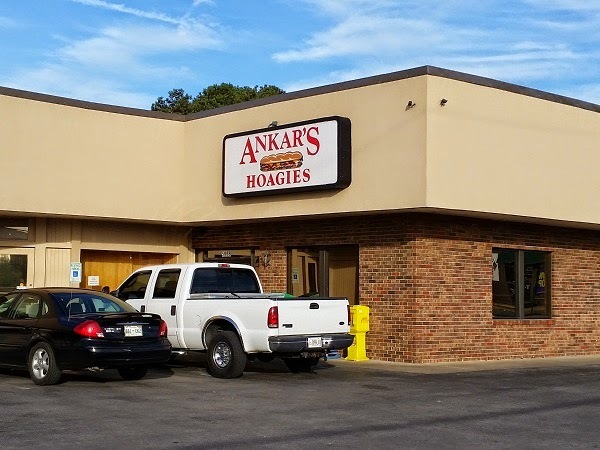 There are three different Ankar’s Hoagies locations around Chattanooga. I believe that two are owned by Sam Ankar, and we stopped by the location on Brainerd, across the parking lot from Rib & Loin and that awesome Sir Goony’s golf course. There’s another with that logo near Northgate Mall in Hixson. A third, with a different logo, is downtown and I believe that this one was owned by George Ankar, who passed away in April. The Ankar family is originally from Ramallah, in the West Bank. I asked the counter staff whether the family had ever lived in Jacksonville, but nobody was sure. There’s a source for Jacksonville’s delis that’s even better than Edge’s overview, and that’s a 2010 story by viCARIous about riders, cherry limeade, and steaks-in-a-sack. Or steak-in-a-sacks. Or sac, however its spelled at the restaurant in question. 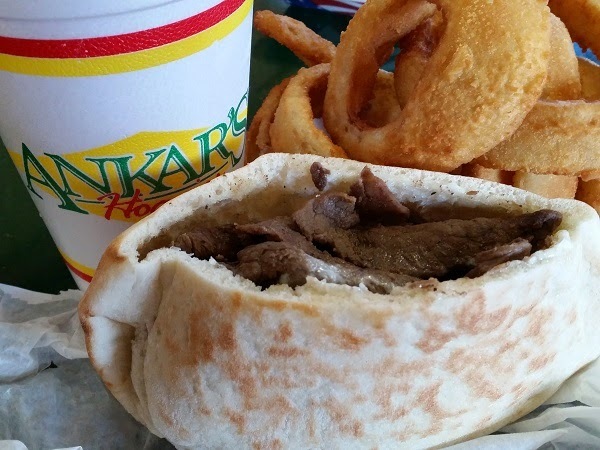 Anyway, if you read her awesome story, you’ll get a good sense of what the delis there offer, and Ankar’s, despite looking more like a 1970s fast food place with some American beers on draft, has a menu absolutely like a deli from northeastern Florida. I ordered the steak-in-a-sack, because I’d never had one of those, and made the mistake of declining the offer of cheese. It wasn’t bad, but I’m sure it’s a much better little sandwich with cheese; as it was, it was kind of dry. I’d like to come back another day and try either a club or a camel rider. I’ll definitely order the onion rings again. They give you a heaping pile, and they are excellent, with very similar breading to the very good ones at South 21 in Charlotte NC. The cherry limeade here is called a Lime Supreme, and it’s a little more cherry than it is lime; very sweet and not tart. Our son, who was enjoying some fries, gave me an evil eye about the cup of water in front of him – he had a big cup of orange soda earlier in the day – grumbling “I’m allergic to water.” I’m not sure where he picked that up, but we’ve taken to replying, “You and the Wicked Witch of the West, yes.” Eventually, I relented a little bit. Of course he could have a sip. This was the final stop on our Chattanooga tour; we were here to pick up the girlchild after a week away. She’d been delayed, and asking our son to wait patiently in a restaurant for what turned out to be a long time was a bit much. Marie took him across the parking lot to Sir Goony’s while I waited a lot longer. As I watched the news, I noticed that the table turnover is very slow here on Saturday evenings. Lots of people stay here for a good while over a pitcher of beer and a basket of onion rings. The lunch rush is apparently pretty frantic and fast, but rather than dying off in the evenings, it becomes a good neighborhood stop with a decent crowd, taking their time and enjoying the good food. Posted on June 3, 2015 August 21, 2017 by Grant G.Posted in chattanooga, local chains, sandwiches, tennesseeTagged chattanooga, local chains, sandwiches, soda, tennessee. Those onion rings look like they’re worth eating! I want that! If I time it right, I’ll be in Chattanooga Friday late evening on my way back from Kentucky, and I really am hoping I’ll get the chance for some rings and a Lime Supreme if I can get to town before they close. Fingers crossed! …I didn’t. Went to Shenanigans in Sewanee instead though. Pingback: Shenanigans, Sewanee TN – Marie, Let's Eat!